It is wonderful, and not as stinky as all that. There was little to no aroma near the entrance to the Enid A. Haupt Conservatory. And only a little at the back side of the Palm Court pool. Even then, you had to lean in to get a wiff of old gym locker aroma. I asked if there was a name. Nick said some people went for a casual, affectionate nickname sort of name of Corpsie. Since we had been on tenterhooks for the last week there were others (the more literary group) who had suggested Godot, as in waiting for . . . .
And will there be offspring in the form of seed setting? Maybe. Corpse flowers you see, have separate male and female flowers. That open on different schedules. They do not like to self-pollinate. 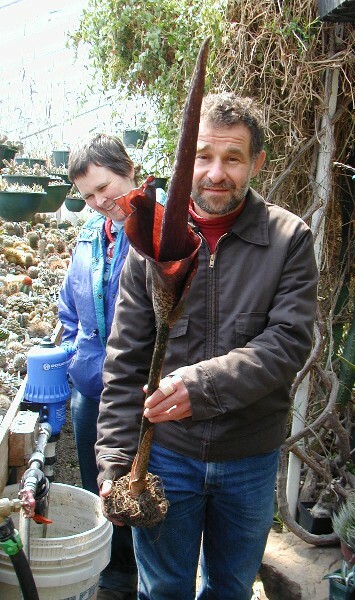 Mark Hachadourian is hoping for some pollen from another botanic garden with a corpse flower currently in bloom. 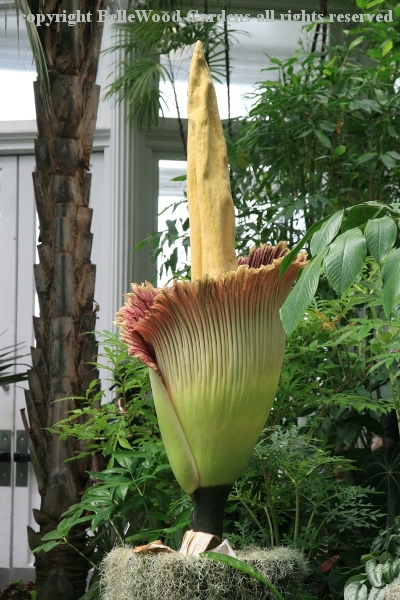 But it has to ship overnight in a refrigerated package . . . .
Who knew so many people would want to come and see a smelly plant that is in bloom for about a day? The parking lot was filled, cones closing it off, and people sent to park at Lehman College across the street. SO many people that the ticket booths had run out of maps. 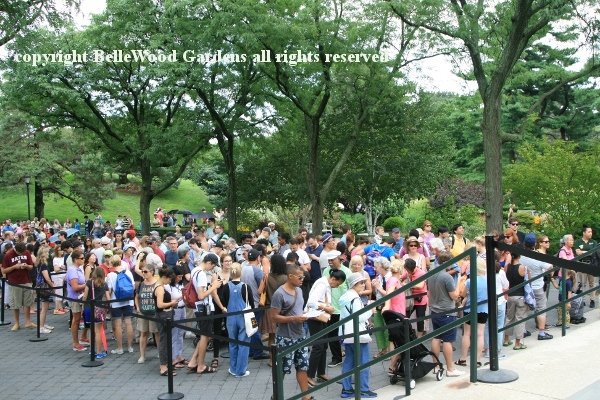 I got in line at 11:08 a.m. and reached the conservatory entrance a little over a half hour later. It was wonderful to see the diversity - everything from babes in arms to small children, teenagers, young adults, parents, millenials, baby boomers - everyone cheerful and patient. And every ethnicity you could imagine for New York City. Many newcomers to the garden - I hope they come back again. I admired Godot some more. 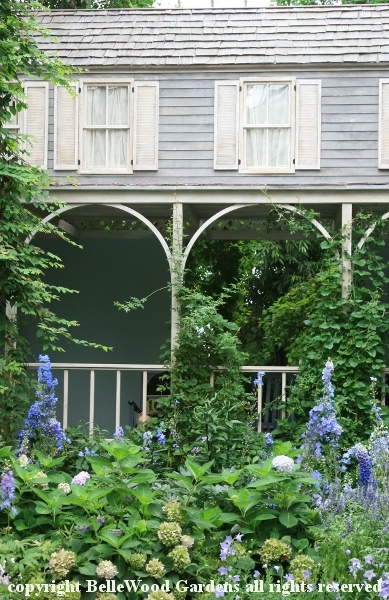 Then into the seasonal exhibition wing to again enjoy the American Impressionism display. 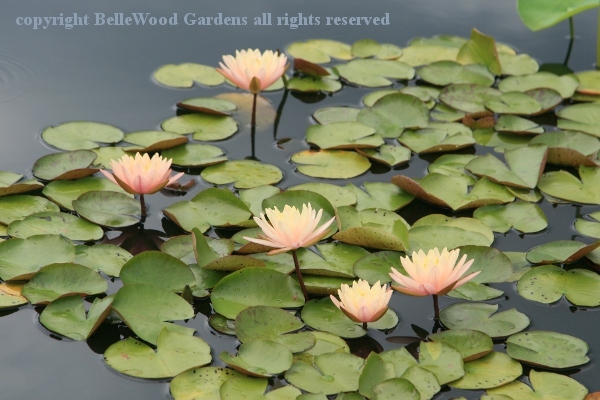 Went outdoors to the waterlily courtyards to admire the waterlilies, lotus, and goldfish. had both widened and lengthened. Now about an hour wait, I heard. a corpse flower again blooms at the New York Botanical Garden. At 5:14 p.m.I was informed that We Have Action! The spathe is starting to unfurl. 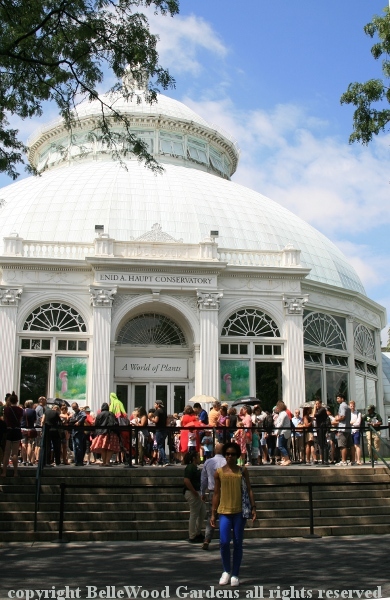 "The corpse flower has started its bloom cycle as of 3:30 p.m., Thursday, July 28! It's expected to last 24-36 hours, so Friday, July 29, should be a great time to see it! 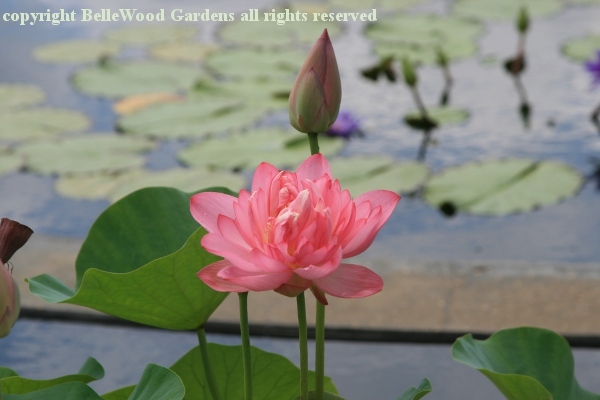 . . . . We will remain open 9 a.m. - 8 p.m. on July 29 to accommodate the bloom!" I have now scuttled my plans for tomorrow and will be motoring off to the city. It has been about a week. We're all still waiting. 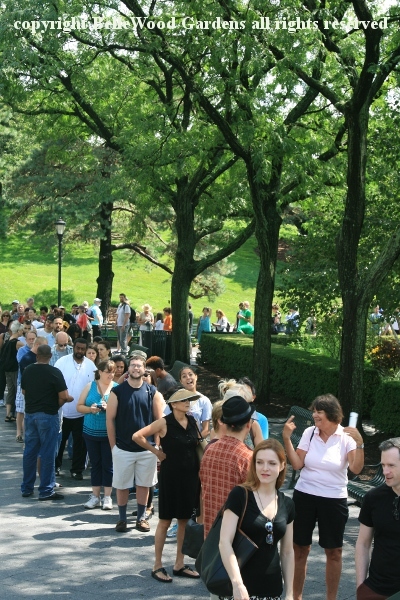 Nick Leshi at the New York Botanical Garden told me, "I feel like I'm waiting for a new baby to be born!" I know. 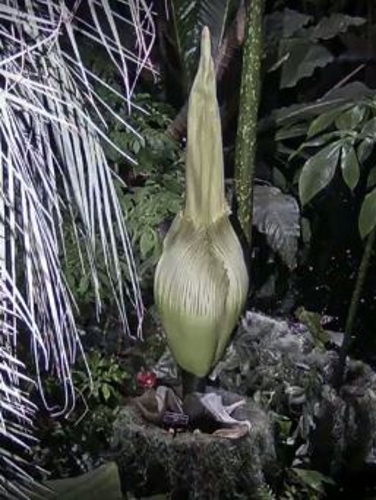 I compulsively check the corpse flower cam several times a day. Apparently the spathe starts to unfurl in late afternoon, opens overnight, remains open anywhere from 12 to 24 to 36 hours. And then collapses. 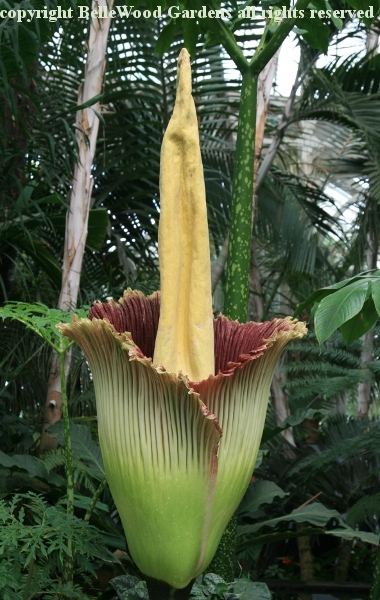 How to know when will it unfurl to its most awesome, stinkiest stench? An informative question and answer page from the Chicago Botanic Garden offers this information: "There are three main clues we look for when determining the peak bloom. . . . . Second, the two protective modified leaves (called bracts) that encircle the base of the spathe begin to shrivel and dry up. In the days before full bloom, they fall off - first one, then the other. That's a sign that the bloom is likely to happen. Finally, the frilly leaf called a spathe - which was tightly wound around the towering spadix as it shot up- starts to loosen its grip as bloom time nears, revealing the crazy-beautiful maroon color inside. 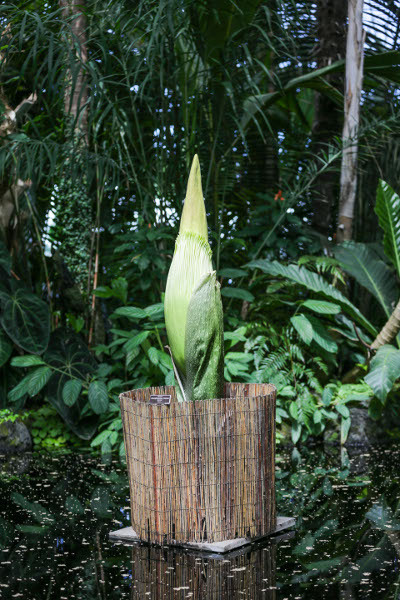 Once the spathe begins to loosen, a bloom is imminent. It's really not an exact science, but these clues give us a general time frame for the bloom." At this point in time - late Monday afternoon - my most recent perusal of the corpse flower cam reveals the two bracts flopped over. But still attached. I'm going to take Wednesday night for its most magnificent smelliest, and plan to drive in on Thursday morning. Of course this is subject to change. It looked this like on Wednesday, 20 July. . . . . and like this on Tuesday, 26 July 2016. It didn't come from outer space, certainly wouldn't be found in a flower shop, and doesn't feed on blood. 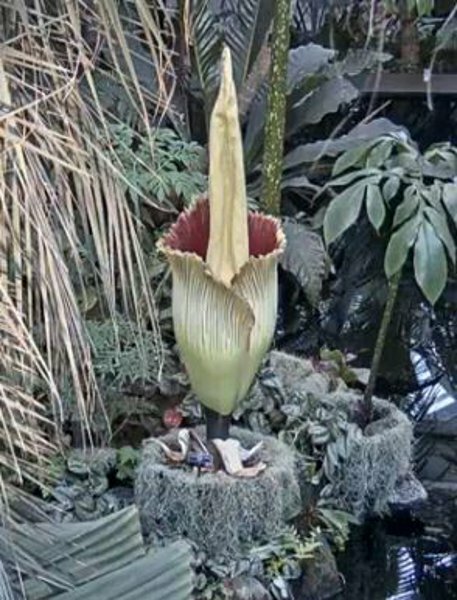 But corpse flower, Amorphophallus titanum, is a spectacular rare plant that infrequently flowers, attracting droves of visitors to admire its supersize bloom while holding their noses. To put it mildly, it stinks. 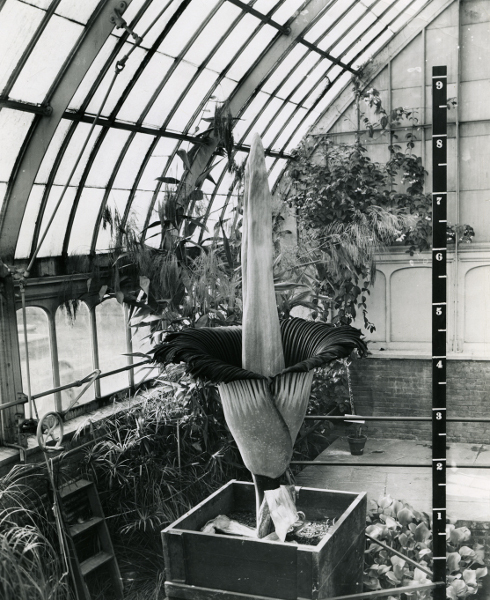 This historical image of a corpse flower in bloom gives us an inkling of the brobdingnagian scale, better than 8 feet tall. Ten years or more bulking up to its performance, which lasts for only a day or two. Not quite yet. Probably this coming weekend. The corpse flower, Amorphophallus titanum, at the New York Botanical Garden is within a few days of coming into full bloom. For their updates check here. I will, of course, be making a visit. My pictures and information will follow here. Scent, it is said, is the most evocative of all our senses. Birch firewood, for example, would remind my father of his boyhood in Sweden. There are delightfully fragrant scents: fresh mown grass, a cake just out of the oven, freesias or roses in bloom. And then, stenches: rotting meat on a hot summer day, rotten eggs, feces. Now, a plant's purpose in life is to make more of the same. The roadside tawny daylily, Hemerocallis fulva is sterile and propagates with offsets. The majority do so with seeds. If they are wind-pollinated, grasses and pine trees for example, then flowers are small and inconspicuous. The wind blows for free. Iris have yellow "bee guide" markings that, like McDonald's golden arches, advertise the presence of something tasty to attract honey bees and other pollinators. And then there are plants that just outright stink. Why? Because their pollinators are beetles that would otherwise be attracted to rotting meat. There's dragon arum, Dracunculus vulgaris, which I grew for a number of years. Its flowering would announce itself with a powerful dead-woodchuck-by-the-road aroma in June. No sign of it this year; I think last winter was too much for this borderline hardy tuber. 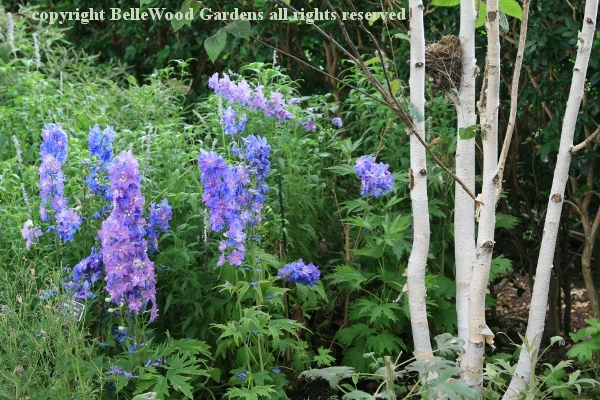 more modest in size and reliably flowering every year. How fortunate. Not.